“The geographic center on an area may be defined as that point on which the surface of the area would balance if it were a plane of uniform thickness, or in other words the center of gravity of the surface. The triangular station is the reference point for all property lines and city, county, State and international boundaries on the North American Continent that are tied to the national triangulation network of the United States, Canada, Mexico, and Central America. This triangulation station is the base point of origin of geodetic positions and directions in the triangulation net of the United States because it is at the junction of the main east-west transcontinental triangulation arc stretching from the Atlantic to the pacific Coast and the main north-south arc, which follows approximately the 98th meridian from the Canadian border to the Rio Grande. The following position should be considered as approximations only. The center is marked with a monument or cairn that is pyramid form in shape. It is 21 feet high, 6 feet wide at its base, and setting on a heart shaped foundation. It was built across the highway, Northwest of its present location, by W.B. Paterson and E.B. Paterson with the assistance from local Boy Scouts and other young men in the community. The Rugby Lions Club donated cement and other materials used in the construction. It was completed in August 1932. 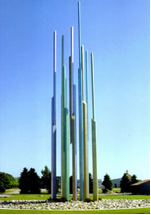 This 88 1/2 foot tall illuminated steel structure, coated with multi-colored shades of metallic paint is dedicated to on of Northern plains most stunning natural phenomena, the spectacular beauty of the Aurora Borealis. 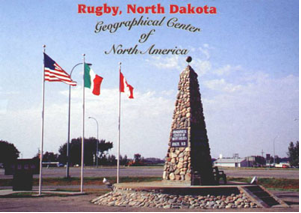 The City of Rugby, North Dakota, has long been recognized as the Geographical Center of North America. 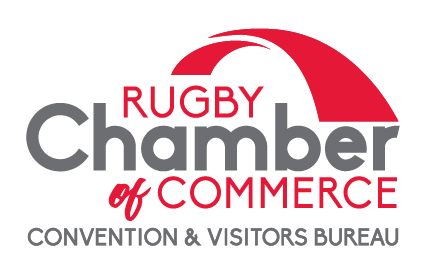 In early 1996, plans to develop a tourism site, which would further reflect and enhance Rugby's unique heritage. The vision called for an interpretive center that would be unique, informative, and congruent with existing tourism resources. 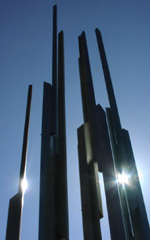 This 88 foot steel monument, lit at night by multicolored lights projected from below, rises out of the prairie to mark the interpretive site and recreate the spectacular beauty of the Aurora Borealis. Offers a monumental vista dedicated to one of the Northern Plains most stunning natural phenomena, The Aurora Borealis. Provides perhaps the only site anywhere dedicated not just to a region or county, but a continent. The designation, Geographical Center of North America, which includes the United States, Canada, Mexico, and Central America, adds an international flair which invites new areas for interpretation, education, promotion, and exchange. Offer on-going educational opportunities for visitors from far and near, school children, and for people of all ages. The Interpretive Center is an excellent site for natural science programs, such as those relating to the aurora borealis, comets, or other astronomical phenomena. The Site is located east of the junction of Highway 2 & Highway 3, Rugby, N.D. The Tower was completed in 1999 and the Interpretive Center was built in the year 2003. An extensive landscaping project will be completed in the summer of 2008 and improvements to the current lighting at the Northern Lights Tower are in progress. 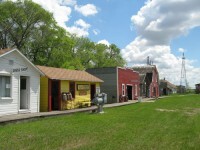 Prairie Village Museum at the Geographical Center of North America features 23 historic buildings and six exhibition halls arranged around a quaint village square. Take a walk through history as you expore a train depot, livery barn, an 1885 log cabin, general store, and of course, a saloon. 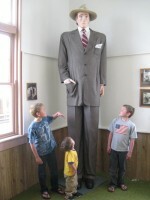 In two-story Silva Consolidated School, you'll find a replica of Silva native Clifford Thompson, one of the world's tallest men.The museum's expansive collection includes everything from Native American powwow dresses to antique cars and farm machinery, to a real iron lung. Visitors are consistently impressed by the depth and breadth of our collections. Plus we're within walking distance of the historical marker at the Geographical Center of North America. The Hawk Museum has a vast collection of antiques and contains thousands of farm implements, in both miniature and full size. At this unique museum you will see one-of-a-kind vehicles, like an unusual walking machine for going over rough terrain, and the only operational 1912 Hackney Auto Plow. The Hawk museum collection is housed in many building with a multitude of small collections, plus more than 300 large antiques, like a 1900 McCormick grain reaper, 1890 threshing machine, 1912 Rumley gas pull tractor, 1911 Nilson tractor, 1912 Metz car, several buggies and much more. What fun for young and old to see a beautiful collection of over 400 clocks displayed by Dale Hawk's brother Dean. The Clock House is a 'must' to see. Mylo Hall is a favorite for many activities...the smooth poured concrete floor makes for great dancing and the beautiful wooden rafters makes decorating fun for any occasion. Many family reunions are held every year at the museum complex. The picnic shelter includes a fully equipped kitchen with a covered dining area and has a music pavilion in front of which will accommodate small groups for outdoor entertainment. Public restrooms and lot of parking including handicapped are nearby. Public events are held through out the summer months. Our most popular being the Hawk Annual Antique Farm Show which held the second weekend of June. This event starts Friday morning with a pancake breakfast. A wide range of activities continue until sunday evening. There live music, parades of antique cars and tractors. Watch the sawmill and threshing of grain by using old steam engines. Bring the kids. There are children's games, buggy rides and plenty of activities to keep them entertained. 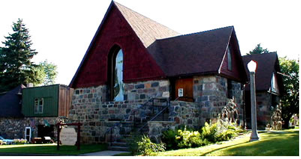 The former Saint Paul's Episcopal Church is located at 312 Second Avenue South West in Rugby, North Dakota. It was placed on the National Register of Historic Places on December 3, 1992. The church building was dedicated on January 25, 1905, the cornerstone having been laid in September, 1903. The church is of the Late Gothic Revival architectural style. The walls are made of local split fieldstone, roughly dressed and well laid up in courses. No particular color dominates, but pinks, grays, and tans are well represented. The ornate stained glass windows of the church were originally in the Holy Trinity Episcopal Church at 42nd and Madison Avenue in New York City, which was dedicated on April 17, 1865. and torn down in 1899. They were a gift to the parish of this 'prairie mission' by the church in New York by paying the shipping costs of $40.00. Interior arrangement and details continue the liturgically correct Late Gothic Revival design of the exterior. An important defining feature are the four sets of heavy wood cross trusses and the fine wood ceiling and wainscoting on the lower part of the walls. The church was closed in 1978 and deconsecrated in 1991. It is now called the Victorian Dress Museum. A collection of 23 reproduction - prize winning - Victorian style dress are displayed with accessories in the building. 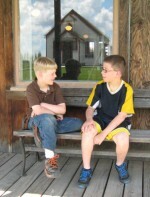 Tours can be arranged by calling 701-776-2189. Straddling the U.S. - Canadian border of North Dakota and Manitoba is one of the greatest symbols of peace Each year, more than 150,000 people from around the world visit the park to enjoy its colorful gardens, landscapes and wilderness areas. 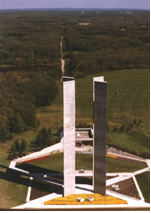 The International Peace Garden has served as a unique memorial to the peace that has existed between the United States of America and Canada since 1932. The International Peace Garden began as a dream of Dr. Henry J. Moore of Islington, Ontario, Canada. Dr. Moore, the lecturing horticulturist for the Ontario Department of Agriculture, was on his way home from the 1928 annual meeting of the National Association of Gardeners, a U.S. organization, when he conceived the idea of a botanical garden commemorating the long and peaceful coexistence of the people of Canada and the United States. Dr. Moore presented the idea of an 'International Peace Garden' at the association's 1929 annual meeting in Toronto ­- the first time the session had been held outside the United States. The proposal was approved, an international committee was formed, and the search began for an appropriate site for the garden. Dr. Moore and Joseph Dunlop of south Euclid, Ohio, came to the Turtle Mountains at the invitation of the International peace Picnic Association -- a group formed, in part, to promote the area as the location for the International Peace Garden. Moore and Dunlop liked what they saw. As you arrive at the International Peace Garden, large formal gardens greet you as you pass through the gate near the Cairn. The Cairn (the stone structure between the two flag poles) was built in 1932 for the dedication of the park. It reads, 'To God in His Glory, We Two Nations Dedicate This Garden And Pledge That As Long As Men Shall Live, We Will Not Take Up Arms Against One Another'. The Floral Clock is just to the South of the entry gate . This unique working time piece features a different floral display each year. It's a favorite stop for kids of all ages.